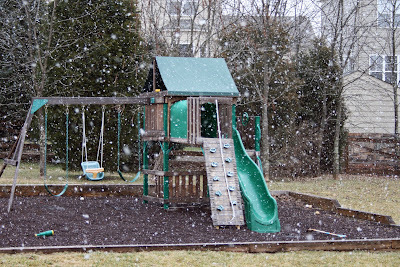 our perfectly imperfect life: It snowed ... for a minute. Sigh. C'mon ... can't we get more than a few flakes? Mason and I were so excited to look outside this morning to see snowflakes falling. Surprise, surprise ... they only lasted for a matter of minutes and then we had blue skies and sunshine. Seriously? Mason is just itching to have some snow to play with. I am so sad for him since I grew up in the midwest, where we had no shortage of snow to play with. Hopefully soon, son, hopefully soon. Okay. Come on over. I'll share some of the FEET of snow in my backyard, lol! I didn't realize you were going to adopt from Russia. How exciting! one of my dreams is to spend xmas and new year in a place with SNOW! this winter has been pretty crazy, today it felt like July, guiack!